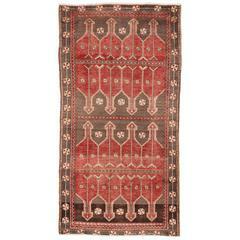 52035 Vintage Turkish Oushak Rug with Modern Nomadic Tribal Southwestern Style. 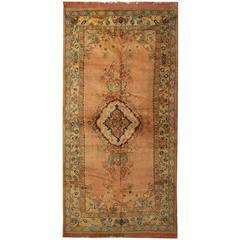 Create a room that feels well-traveled and effortlessly inviting with this vintage Turkish Oushak rug. Five tarantula style amulets dotted with Turkish motifs are encapsulated in the rich waves of the abrashed blue field. A wide border filled with lozenges and zigzags are accented with tarantula edges and two meandering guard bands enclose this work of art. The tarantula is a symbol that prevents bad luck. 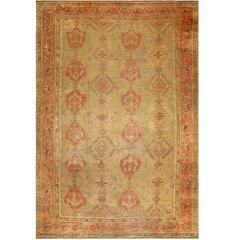 The tribal style and primitive charm conjure the nomadic feeling of Turkish culture in this vintage Oushak rug. Perfect for a front room, living room, bedroom, family room, den, studio, study, office, game room, or library. Well-suited for a wide range of interior styles: Contemporary, Egyptian, Abstract, Bauhaus, Mid-Century Modern, Italian, Traditional, Eclectic, Modern, Contemporary, Industrial, Rustic, Lodge, Cabin, Cottage, Bungalow, Manor House, Craftsman, Aesthetic Movement, Tudor, Spanish Revival, Mediterranean, Art Deco, Ethnic, Nomadic, Bohemian, boho chic, Primitive and Tribal. Abrash. Hand-knotted wool. Made in Turkey. Measures: 10'05 x 12'06. A vintage Turkish Oushak rug. Beige ground with a border containing multiple shades of browns and camel. There is some soft greens and lavender as well. Turkish rug with masculine vibes. A vintage Turkish Oushak rug.